On December 4, President Trump signed into law the Frank LoBiondo Coast Guard Authorization Act of 2018 (S. 140). Title IX of the legislation is the Vessel Incidental Discharge Act of 2018 (VIDA). VIDA will largely cut through a morass of conflicting and confusing requirements that have developed over a number of years relating to discharges into US waters. This purpose of this new legislation is to: (1) provide for the establishment of uniform and environmentally sound standards and requirements for the management of discharges incidental to the normal operation of a vessel; (2) charge the Environmental Protection Agency (EPA) with primary responsibility for establishing standards relating to the discharge of pollutants from vessels; (3) charge the US Coast Guard with primary responsibility for prescribing, administering, and enforcing regulations, consistent with the EPA discharge standards for the design, construction, installation, and operation of the equipment and management practices required aboard vessels; and (4) preserve the flexibility of states, political subdivisions, and certain regions with respect to the administration and enforcement of standards relating to the discharge of pollutants from vessels engaged in maritime commerce and transportation. VIDA immediately repeals the Small Vessel General Permit (SVGP) program. The current Vessel General Permit (VGP) program, including state requirements developed thereunder, will remain in effect as they currently exist until final, effective, and enforceable VIDA requirements are in existence. The legislation adopts for commercial vessels a program similar to the Uniform National Discharge Standards for Vessels of the Armed Forces. Entitled ‘Uniform National Standards for Discharges Incidental to Normal Operation of Vessels’, it focuses largely but not exclusively on ballast water management. I should point out that I have publicly advocated such an approach from 1996 when the uniform standards were adopted for military vessels. When fully implemented, VIDA will remove the VGP program from the National Pollutant Discharge Elimination System (NPDES). As a result, states will no longer be authorized to establish and enforce their own higher standards for discharges, including ballast water management system discharges, incidental to the operation of covered vessels. Instead, states are allowed to comment on and object to proposed federal standards of performance for marine pollution control devices and water quality orders. The EPA is required to consider any state comments and objections and explain in writing the rationale for not accepting the state proposals. The EPA decision in this regard is not judicially reviewable. Because VIDA adopts for purposes of ballast water management system (BWMS) review definitions of ‘live’ and ‘living’ to exclude an organism that has been rendered nonviable or preclude the consideration of any method of measuring the concentration of organisms in ballast water that are capable or reproduction, the new testing protocol will be more consistent with that utilized under the IMO ballast water testing procedures. The US, though, will continue to insist that testing be performed by independent laboratories. It is expected that an increased number of BWMSs that have been approved under the IMO standard will be able to meet the VIDA requirements. Within 180 days (i.e., by June 2, 2019), the Coast Guard is required to publish a draft policy letter describing type-approval testing methods and protocols for ballast water management systems, if any, that render nonviable the organisms in ballast water, taking into consideration testing methods that use organism grow-out and most probable number (MPN) statistical analysis to determine the concentration of organisms in ballast water that are capable of reproduction. A public comment period not to exceed 60 days must be allowed. A final policy letter must be published not later than December 4, 2019. There will be some regional differences in ballast water discharge requirements. A more stringent standard will apply for vessels operating in the Great Lakes and connecting waterways. A somewhat different standard will apply to vessels engaged in operations in the Pacific Region. Passenger vessels operating in Alaska waters will continue to be subject to the current graywater requirements. States will be allowed to conduct their own inspection of covered vessels to ensure compliance with applicable federal standards. In addition, states will be allowed to charge a fee for such inspections. The Coast Guard, in consultation with the states, will develop, publish, and periodically update inspection, monitoring, data management, and enforcement procedures for the enforcement by states of federal standards and requirements. States will also be allowed to regulate sewage discharges from vessels. The Coast Guard will, upon request, provide access by states to Automated Identification System (AIS) arrival data for inbound vessels for specific ports or places of destination in that state. The EPA is required to develop a ballast water discharge risk assessment and response framework using ballast water discharge data and aquatic nuisance species monitoring data. This risk assessment will be used to identify and track populations of aquatic nuisance species; evaluate the risk of aquatic nuisance species establishing and spreading in US waters; and establish emergency best management practices that may be deployed rapidly, in a local or regional manner, to respond to emerging aquatic nuisance species threats. A similar program has been adopted in Australia. 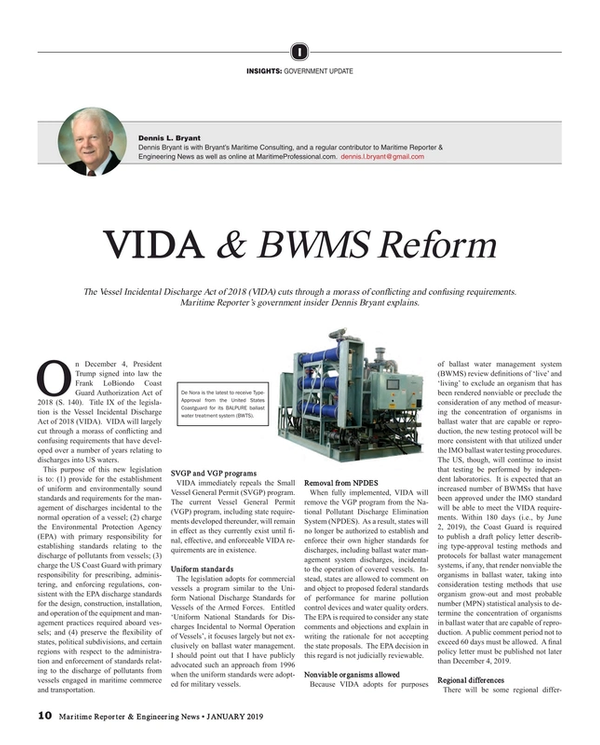 With regard to incidental discharges other than ballast water, it is expected that the requirements of the current VGP program will be transferred over to the new VIDA system with minimal substantive changes. The major difference will be, as previously noted, that the state requirements will go away, except to the extent that a state can convince the EPA that a particular provision is justified. VIDA includes a number of aggressive target dates for promulgation of implementing regulations. If experience is any guide, it should be expected that most, if not all, of those target dates will not be met. Regardless, the framework has been established to bring increased sanity and uniformity to ballast water discharge management and the incidental discharge of other substances from vessels.